Italians are inordinately fond of crostate, simple short-crust tarts made with jam and/or fresh fruit. Large crostate are a common dessert, and tiny ones even make an appearance at breakfast. Throughout the country, crostate are as ubiquitous as brownies in the U.S. Sadly, I have no local bakery source for these simple sweets, so I’ve been working to perfect my crostata. Thanks to Carol Field’s The Italian Baker, I can quickly and easily replicate the crust. By making a single batch of pasta frolla crust and dividing it into four, I can freeze dough portions just large enough to cover an 8-inch, removable bottom tart pan. The frozen dough defrosts at room temperature, achieving roll-ability, in 30 to 45 minutes. The filling–usually nothing but jam straight out of a jar–turned out to be the hard part. Italian jams contain less sugar and more fruit than their American counterparts. Even the “better” brands of supermarket jam turned sticky-sweet and runny after baking. Eventually, I found that D’Arbo brand Austrian jams have enough fruit content to hold their own once baked into a tart, but I don’t have a consistent source for D’Arbo. But certain flavors of Bonne Maman brand worked well; the wild blueberry preserves are the top crostata performer in my kitchen. Back to the tart: once the dough is pressed into a pan, partially bake it at 350 for 10-15 minutes until it just begins to brown around the edges. Remove it from the oven and spoon on 3-5 tablespoons of good quality jam, spreading it nearly to the edges. Top with a layer of thinly sliced stone fruit. Bake for an additional 15 to 20 minutes (or longer, for a more deeply browned crust). 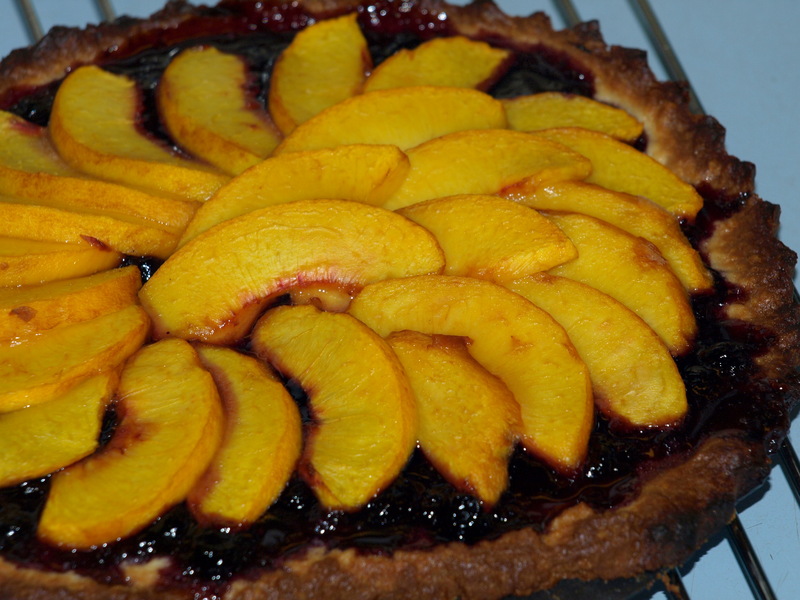 The peach-blueberry tart pictured above was baked in a $40 convection toaster oven, so I didn’t even have to heat up my kitchen to turn out this treat. With minimal active time, the tart goes from freezer to table in an hour and a half, with minimal active time. Pretty enough for guests, yet simple enough for breakfast, and an ideal way to use up summer’s peaches and plums.